SINCE AFRICAN CHURCH FATHER Tertullian wrote (c. 200) that “the blood of the saints is the seed of the church,” African Christians have never lived without persecution. Yet in the midst of the suffering, the African church has expanded. 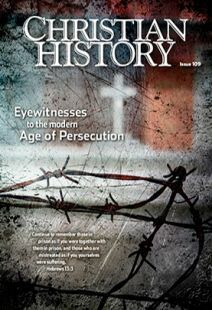 Persecution dogged Christians in Ethiopia since Christianity was first introduced there in the fourth century (see CH 105, Christianity in Early Africa). In the centuries since, many Christians have been killed, wounded, dislocated, discriminated against, and terrorized because of their faith. In the modern era, after overthrowing Ethiopia’s last emperor, Haile Sellassie I, the military junta that ruled the country from 1974 to 1991 established a group called the Derg (meaning “committee”). The Derg announced itself as the leader of a revolution dedicated to “the eradication of backward practices” and a “root-out of foreign values.” The junta despised and undermined all religious groups but targeted evangelical Christians especially. Western missionaries’ involvement in evangelical Ethiopian churches and Christian refusal to embrace slogans they considered unbiblical (“Above all is the revolution” and “Religion is the opiate of the masses”) caused the junta to be suspicious, labeling Christians as spies, unpatriotic, and a threat to the nation. The Derg suppressed its enemies through long-term imprisonment, torture, denial of rights, and death. Unfortunately this state-sponsored persecution and propaganda also created an environment that encouraged some members of the Ethiopian Orthodox Church to expel evangelicals from a social institution and burial association called the edir. Those expelled could no longer own burial ground for their dead. Though some older and larger evangelical groups like the Ethiopian Evangelical Church Mekane Yesus could hold services legally, others could not, and many churches were forced to close. I will struggle until the end. I believe the God of Israel will give me victory. Some Ethiopian church leaders sacrificed their lives. One, Rev. Gudina Tumsa (1929–1979), was a prominent theologian. Deeply engaged in social work in the community, he encouraged Christian churches to meet the needs of their neighbors. As a response to persecution, Tumsa helped Christian leaders form the first Council for Cooperation of Churches in Ethiopia and served as its first chairman. One of its main agendas was combating the growing influence of Communism. His outstanding leadership and focus on human dignity troubled Communist leaders, and they kept their eyes on him. He was imprisoned several times. He reminded Nyerere, “’Christ died for all that those who live should no longer live for themselves but for him who died for them and was raised again‘ [2 Cor. 5:15]. Never ever will I escape.” In July 1979 Tumsa was abducted and executed. Many called him the African Dietrich Bonhoeffer. African tradition holds that Christianity was first introduced to Egypt by Mark, the writer of the Gospel bearing his name, who established the church in Alexandria. Christianity flourished in Egypt for many centuries. But the situation changed after the Arab-Muslim conquest of 640. Over the centuries Coptic Christians faced persecution, often systematic, from different groups and even from the state itself. In the twentieth century this included death, harassment, and the burning of houses, churches, monasteries, and Christian businesses. Laws against Christians got tougher, and attacks by sectarian groups (like the Muslim Brotherhood, an Islamic political organization) increased. A law passed in 1934 restricted building churches except in locations where there was no mosque nearby. This was later changed, but until the 2011 Arab Spring revolution, churches still needed government approval to be built. Christians also could not participate in political affairs. When they protested, churches, houses, and shops were burned, and Christians were stoned to death. Many expected things to improve when the Arab Spring removed the tyrannical government of Hosni Mubarak (ruled 1981–2011). But instead conditions worsened: many ancient churches were burned, and Christians remained a target of the Muslim Brotherhood with no government protection. In August 2013 alone, around 40 churches were destroyed. Sometimes attacks were encouraged and backed by government officials. Vandals painted graffiti proclaiming “Egypt is Muslim—not Christian” on churches and Christian-owned buildings. Following a 1999 northern Nigerian campaign for the implementation of Sharia law (Islamic law that governs both religious and day-to-day life), Christians became the most persecuted religious group in Nigeria, especially in the country’s northern states, despite government efforts to intervene. In 2012 alone around 900 Nigerian Christians died because of their faith. From 2002 on the Islamic group Boko Haram (meaning “Western education is sinful”) based in northeastern Nigeria carried out attacks on Christians, spurred by a desire to make the area an independent Islamic region. Frequently the group killed Christians, burned their churches, and forced survivors to relocate. leaving villages and possessions behind. In March 2012 over 40 died in a suicide bomb attack beside a bus station in a predominantly Christian neighborhood in Kano. And in December 2013, three churches were burned in Gamboru Ngala. In the end Christianity in Africa has not been crushed; rather it has blossomed. The apostle Paul said long ago: “We are hard pressed on every side, but not crushed; perplexed, but not in despair; persecuted, but not abandoned; struck down, but not destroyed” (2 Cor. 4:8–9). Paul, who passed through much persecution in his life, also wrote, “Who shall separate us from the love of Christ? Shall trouble or hardship or persecution or famine or nakedness or danger or sword?” (Rom. 8:35–39). Yabibal Teklu is a pastor, educator, and doctoral candidate in systematic theology at Yonsei University, Seoul, South Korea, specializing in African theological education. Christians have suffered for their faith throughout history; here are some of their stories.